“In previous times college entrepreneurship was confined to campus borders and most entrepreneurs were confined to national borders, but Kairos transcends these boundaries because, in our inderdependent world, there are no borders when it comes to the pressing issues that we face.” – William J. Clinton, 42nd President of the United States. Globalization has indeed made the world a very small place. And yes, in this new found world, entrepreneurship is getting all its due. Experts from the Bay Area are mentoring farmers in Gujarat and venture funds based in US and Europe are investing heavily in entrepreneurs across developing nations. Be it Kiva or the Unreasonable Institute, be it social or business entrepreneurship, everyday more people are putting in their money and belief in the hands of entrepreneurs and their dreams. And it comes as no surprise that in such exciting times, an international organization like Kairos has invited top student leaders and entrepreneurs from the best schools of India (the Indian Institutes of Technology, popularly known as IITs) to attend a global congruence of students, ideas and entrepreneurship. The Kairos Society is an international student-run not-for-profit foundation based in the United States. Kairos was founded with the belief that the key to improving our world lies in uniting the next generation of leaders, enabling them in turn to create greater impact. Each year, Kairos holds a Global Summit where it brings together its members alongside a collection of the world’s most impactful leaders to discuss the issues facing the world and the emerging opportunities for Kairos students to make a difference. This year, 20 of the most entrepreneurial students from all over India have been invited to represent the country, with the endorsement of Minister Shashi Tharoor, at the Kairos Global Summit beginning April 16th in New York. Some key guests during the summit this year include Phil Condit, former CEO of Boeing; Ellen Kullman, CEO of DuPont, and Duncan Niederauer, CEO of NYSE. Subhendu Panigrahi, a student delegate from IIT Kharagpur, is extremely kicked about the summit and believes that initiatives like Kairos Global Summit are a launch pad for student entrepreneurs to become future business leaders. Vivek Khandelwal from IIT Bombay is also participating in the summit. What’s most exciting for him is that Voicetap, a start-up he co-founded, will be one of the Top 100 Innovative Startups that will be showcasing during the summit. Sunny Purswani, an aerospace engineering student from IITM who co-founded “Connoisseur”, an arts and handicrafts based company and Harsh Shah, a final year student at IIT Bombay, who is the Co-Founder and Director of Talent Acquisition for Nova Global will be also attending the summit. The 3 day summit will also include a trip to The Intrepid Air and Space Museum where students would be addressed by the foremost leaders from the Industry. With the India delegation already including IIT Bombay, Delhi, Guwahati, Kanpur, Kharagpur, and Madras, the Kairos Society will soon add chapters at other colleges across India. On this journey of journeys, solitude found solidarity, ‘I’ turned into ‘we’. — Eduardo Galeano. 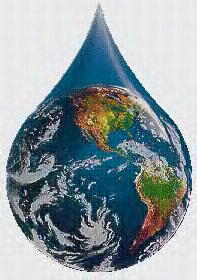 It’s the World Water Day! Today is (was, in India) the World Water Day, an initiative that grew out of the 1992 United Nations Conference on Environment and Development (UNCED) in Rio de Janeiro. The world has changed significantly since 1992. Cities are bigger and more polluted. Rivers are not rivers anymore. Drinking water has become a luxury in developing countries. Harmful affluents are polluting our seas everyday. Yet, the spirit of fighting against everything that is wrong and that needs to change, continues to grow stronger and bring hope to people. In 1992, the daily newspaper and word of mouth were probably the only main sources of information. Today, with information technology and Google Maps in place, you can just go to this link and find out about all Water events happening around the world today. I was on tweeting a lot today and believe me, the last time I had seen these many conversations around a topic was back in December during the COP15 summit in Copenhagen. Every day, 2 mn tons of sewage and other effluents drain into our world’ waters, including some of ours. Groundwater accounts for about 80% of domestic water requirement and more than 45% of the total irrigation in India. Water has always been synonymous with life itself and the current water crisis around the world has reinstated its importance in our lives. Yes, we need better purification technologies, better distribution systems and low cost supply for the unprivileged sections. But most importantly, for those of us who have the luxury to use as much as water as we want to, we need to responsible in how we do that. Plant and maintain trees. An increased tree cover would translate into a lot of benefits like reducing run off, increasing percolation and recharging the groundwater reserves. Install rainwater harvesting systems in your home, school, college, workplace etc. To know more about what happened in India on the World Water Day, do check out the India Water Portal. Once again. Save Water. Save the world. Are you interested in helping a young student team start a social business? Have you been waiting to share your expertise in social enterprise, business or entrepreneurship with others? Here's you chance to create impact by helping nurture budding entrepreneurs. Join Acara Challenge 2011 as a mentor by signing up here. If you want to know more about the Challenge, visit this page.